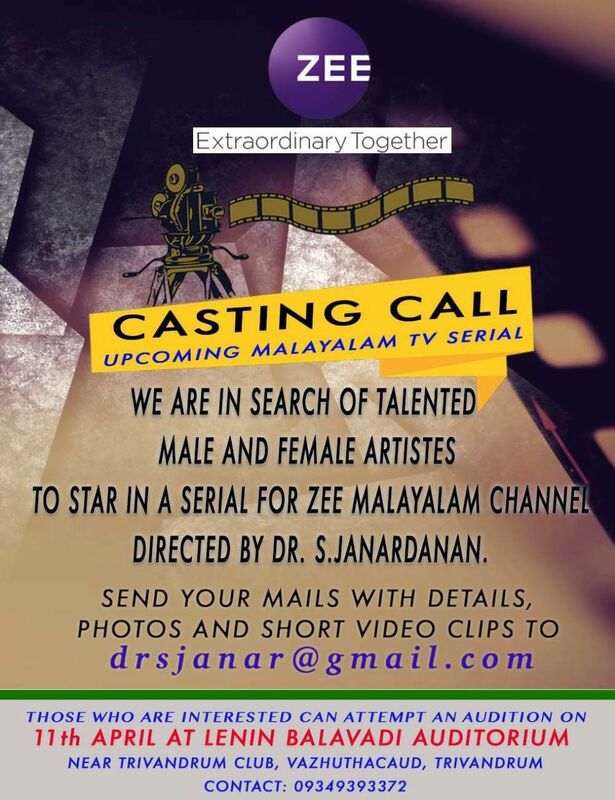 Upcoming malayalam tv channel zee malayalam announced casting call for new television serial. it’s directed by dr. s janardhanan and talented male or female candidates can apply for the same. dr. s janardhanan one of the popular malayalam serial director, now planning a new serial for zee kerala channel. This will be a golden opportunity those who interested to appear in serials. male and female can apply for the auditions, you can check the details from here. zee network’s kerala channel is scheduled to launch on 26th November 2018, they are planning to bring quality serials on the channel. Dr. S Janardhanan is a popular film and serial director, Maha samudram starring mohanlal was his big screen debut. later directed sahasram, suspense thriller with suresh gopi. we wrote the screenplay of prithviraj movie james and alice. Neermathalam , aired on asianet is the latest work by Dr. S Janardhanan and now he is working for a zee malayalam serial. Kalyana sougandhikam, Rahasyam, Vasundhara Medicals , Samaksham are some of the works by the director. he won best serial director award for Samaksham in 2000 kerala state television awards. Indian television network zee planning to bring their malayalam general entertainment channel to the malayalee viewers. They have already bagged latest film rights, in working of serials, reality shows, comedy shows, dubbed content etc.